Shanghai and Gothenburg are sister ports. 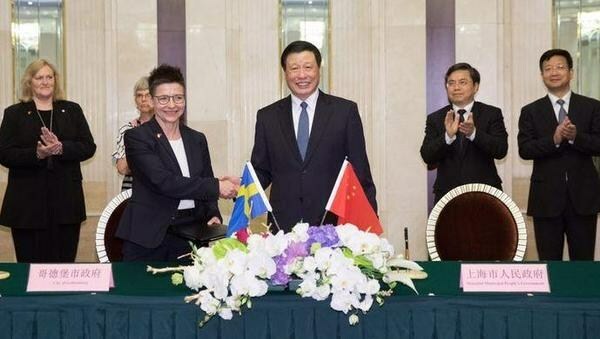 Shanghai Mayor Ying Yong met his counterpart from Gothenburg, Sweden, Ann-Sofie Hermansson, on Wednesday and both oversaw the signing of a three-year cooperation agreement between the two cities. Ying said Sweden is one of the first European countries to establish diplomatic relationship with the People’s Republic of China. The two countries deepened their ties in recent years. Shanghai and Gothenburg have cooperated extensively in trade, port construction, shipping, science and technology, education and other areas since they became sister cities in 2003. Shanghai Mayor Ying Yong met his counterpart from Gothenburg, Sweden, Ann-Sofie Hermansson on Wednesday. He said Shanghai and Gothenburg are sister ports. SAIC and Volvo have a bus-making joint venture. The voyage to Shanghai by the reconstructed ship East Indiaman Gotheborg III, and various cooperative projects have strengthened ties between the two cities. The mayor said Hermansson’s visit and the renewed agreement will deepen bilateral cooperation and promote exchanges in urban construction and management as both cities face the same challenges in this area. Hermansson said it was her first visit to Shanghai and she wants to learn more about this city. She stressed that Gothenburg wants to cooperate closely with Shanghai in urban construction and management and in other fields. Lisette Lindahl, the Swedish consul general in Shanghai, was present at the meeting.